We at George’s Sierra Shell understand the importance of having an auto repair facility you can trust. We appreciate that the safety of your family is often dependent on the mechanical condition of your vehicle. When you bring your car to George’s Sierra Shell, we recognize the enormous trust you are placing in us, and everyone on our staff takes this very seriously. We understand you expect your car to be restored to top driving condition. You also expect prompt service and a courteous, competent staff at our Fontana auto service.. You should expect these things, and you should also know that George’s Sierra Shell has been meeting these expectations since 1972. See for yourself and read our customer’s testimonials. We are the facility whom other local shops refer vehicles that they cannot diagnose and/or repair. We have achieved this status among the public and our peers by our Rock-Solid Commitment to truth, integrity and ethics. Today, George’s Sierra Shell is still the fastest growing and most recognized automotive facilities in the Inland Empire. We continue to be at the forefront of our industry with our commitment to excellent customer service and repair. 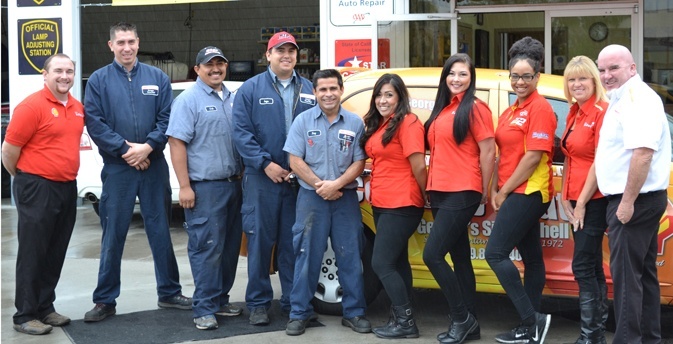 The entire team at George’s Sierra Shell strives to be the finest Inland Empire and Fontana auto service and business. But please, don’t take our word for it! Next time your vehicle needs service or repair, call and schedule an appointment with us. We want you to experience the unparalleled service that our customers have experienced since 1972!